Nobel Laureate, Paul Krugman, sees some chance of a global recession late this year or next, but Monetary Authority of Singapore (MAS) Managing Director, Ravi Menon, sounds more relaxed - where do we stand? Paul Krugman has been quoted recently as saying that there is some chance of a global recession late this year or next. There is no widely accessible global recession indicator. But there are such indicators for the US, from which, most of the global business cycle usually starts and ends. 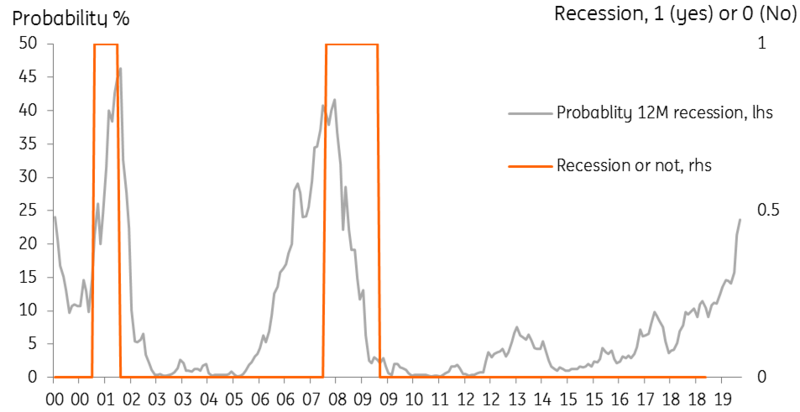 One readily available indicator, the NY Fed index, has a recession in 12 months probability running at a 23.62%. That sounds a bit elevated, but not quite ringing alarm bells. That said, this index has almost never risen from a lower level to reach this point, without then going on to register higher probabilities and in due course a recession. False signals are extremely rare. That is concerning. As for a global recession, this is harder to define, with no widely accepted definition. The IMF has a rather complicated definition, involving declining Purchasing Power Parity (PPP) based per-capita GDP backed up by one of seven other indicators including oil consumption and per capita consumption amongst others. But for most of us, lacking the resources of the IMF, this isn't really all that helpful. Perhaps a more accessible version is an older IMF definition, which backs out the global GDP growth rate from the per capita GDP cut-off, and suggests that a global recession happens when global growth falls below 3% per year. For the next several years, the IMF is forecasting global growth of just 3.6% to 3.7%. The buffer is small. Moreover, such forecasts tend to be a bit behind the curve. Have the IMF fully taken on board the effect of tariffs on China's exports and growth? Or the impact of the semiconductor cycle? US growth looks good for now, but some aspects of it suggest some slowdown this year and next, so is that baked firmly into the forecast? And Europe, it already looks slow and judging by business sentiment indicators, could slow further. India stands on the brink of a perilous standoff with Pakistan. Brexit may still happen badly (see here for latest). I could go on, but for the sake of brevity (and sanity), I won't. In short, the 0.6% buffer does not look terribly large or very comforting. Now before I describe what MAS Managing Director, Ravi Menon, had to say yesterday about the Singapore and Global economies, let's be clear about priorities. Mine, as a market / bank economist, are to look for things that are about to go horribly wrong, to provide a prior warning for our clients. Mr Menon's, are to preserve and foster economic and market confidence. We are bound to look at the world in a different way, and our conclusions, as a result, may differ widely for perfectly legitimate reasons. Menon suggested, contrary to things we have said in this note, that there is no reason for (other) central banks (CBs) in Asia to ease rates, describing the hikes by some regional CB's last year as appropriate and sensible. I agree with the last bit, and the room for easing may be limited, and probably for later in the year, not now. But real rates in a number of Asian economies, Indonesia for one, Korea another, look high enough to offer domestic economies some support through possible future easing, and not just if external conditions worsen, as domestic conditions aren't looking too impressive in some economies either. Menon also takes a different view than Krugman saying that the global economy isn't heading for a hard landing in 2019. Adding that China's slowdown is enabling it to reach a more sustainable growth rate. I tend to share his conclusion, but I would be far more cautious about the hard landing outlook, You see, to me, this still seems like something that could happen, even if on balance I don't think it will. But then as mentioned earlier, my job is to highlight risks, not to calm nerves. As far as Singapore goes, Mr Menon was similarly upbeat, though there was just the hint of a door being opened for future changes in policy direction (next MAS meeting is in April) as he is quoted on Blomberg as saying that although there is no need for stimulus if the economy evolves as expected in line with MAS forecast ranges "two months is a long time, so we'll see how it looks like then". That may be the most significant comment of the lot. The SGD is a little softer overnight. The MAS decision in April is unlikely to show a change in the NEER policy, but I would say the risks of an easing grew a very small amount following these remarks. Bank of Korea - probably won't ease, but should they? A weak domestic economy, very low inflation, external headwinds - all of these are ingredients for a rate cut from the Bank of Korea (BoK) today. Yet not a single economist in the Bloomberg consensus thinks there will be a cut. Why? Probably for similar reasons as Mr Menon cited earlier for other Asian central banks. Though that time may well come later this year. We all wait with bated breath on developments between the US and China on trade. The possibility of auto tariffs would also seriously affect Korea's stumbling economy. A rate cut later this year might well be on the cards and would be entirely warranted if it came under such circumstances, in my view. India is the last Asian country to report GDP data for 4Q18 today. We expect it to join the majority of regional countries in posting slower growth, and consider consensus estimate of 6.8% YoY GDP growth subject to downside risk from a slowdown in exports and manufacturing (ING forecast 6.6%). The escalation of border tensions with Pakistan overshadows the economy and markets. The INR has depreciated 0.6% since the tensions started with the terror attack on 14 February and it is down 2.1% year-to-date, the most among Asian currencies. There are no reasons for the depreciation pressure to ease as the tensions will likely remain a burning issue going into elections in May. Thailand’s balance of payments data for January is expected to show a sharp negative swing in the current account balance, just like we saw from the customs-basis trade balance, which plunged to a deficit of $4 billion in the last month from $1.1 billion surplus in December. Having dropped to 7.5% of GDP in 2018 from 11% in the previous year, we forecast that the current surplus will shrink further to 4.5% in 2019. Yet it remains a strong support for the Thai baht, Asia’s best-performer currency last year and remains so this year (see “Thailand: Steady economy amid political risk”).